Do you want to make more money? Of course you do. We all do. 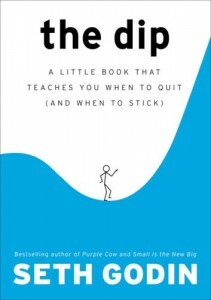 For the past few days, I have been reading the book “The Dip: A Little Book That Teaches You When to Quit and When To Stick“ by Seth Godin. The premise of Godin’s book is that we are a society of generalists or multi-taskers, and we should concentrate on one or two things that we can become #1 at accomplishing. Winners Quit. Godin makes the claim in his book that winners actually quit all the time which is contrary to everything that we have been told since grade school. But, he has a point. The secret to a lot of people’s success is that they saw the writing on the wall early in life and diverted their attention to the one thing that they were really good at. Michael Jordan loved to play baseball and golf. We saw that later in his life when he tried those sports out at the minor league level. But, it was basketball that Jordan was great at. That is where he spent all of his time concentrating his talent and learning to hone his skills. He did not waste time on those other distractions early in his life. The Dip. The dip in life and in Godin’s book is the roadblocks, the barriers to entry, the tests that keep people out, etc. Winners and world champions still face the same dip or challenge, but they power through it. The rest of us just up and quit because it is too hard. There is a reason that God invented Organic Chemistry. It is to keep guys like me from trying to become doctors. Organic Chemistry is the one very hard course in an undergraduate pre-med curriculum that separates the real soon to be doctors and the pretenders. It is “the dip”, one of many in that profession. If there was no dip, it would not be worth doing. Why Bring This Up? Okay, this is interesting, but so what? Are you number one in your profession? Are you number one in your office? You have to be to successful, earn the most money, earn the promotions, and rise to the top. The world today thanks to the internet and other means is a world full of mediocrity. Most people can squeak out an existence and be average, but only one or two people can become great in their field. Think of it this way….would you want to go to the best oncologist in your city or just an average one? We all participate in some very meaningless activities throughout our day that do not move us forward. Do you want to be the best? Are you focusing enough of your energies on conquering your market or leading your sales team? What activities are you wasting your time with? What should you quit in order to focus on more important endeavors? Watching TV. The average American spends over 4 hours every day watching television. I am not bashing the practice because heaven knows that I love to watch baseball games every night. But, there are better uses of my time that those three hours per day watching the tube. If I worked 16 hours per day instead of eight, those three hours are costing me money. What if I could double my salary through a side business or some other venture? Checking E-Mail. There are people in my office who are addicted to checking their e-mails and updating their Facebook status. We spend a lot of time going back and forth to our e-mail programs. We lose productivity. Do you ever find yourself answer e-mails as soon as it lands in your in-box? In a way, we are turning e-mail into instant messaging. Tim Ferriss recommends only checking e-mail once or twice a day in his book, “The 4 Hour Workweek“. You might think that you cannot get away with that, but you will find that there are very few real emergencies that are handled over the internet. If your boss needed something that badly, he or she would just pick up the phone. Cleaning Bathrooms. Recently, my wife and I hired a cleaning service to come in and clean our bathrooms and the kitchen twice a month. While we know that we could do these tasks ourselves, we find our lives much more fulfilled and less stressful by not doing them. And, there is an efficiency standpoint to consider as well. I am not a good cleaner. I’m sure I could learn, but I am not good at it. It would just be better for me to let someone else handle that while I focus on tasks that I am good at. Mowing The Grass. The same is true for mowing the lawn. I can do it, but I am not very fast at it. We hired a professional through Craigslist, and he even has the professional grade zero turn lawn mower than can mow our one acre lot in record time….way faster than I can push my $100 Wal-Mart special mower. Fixing Your Own Car. I am not mechanically inclined. My best friend and I tried to change my oil one time in his parents’ driveway, and we gave up after two hours and a bag of kitty litter. For me, it is not worth my time to change my own oil. There is an opportunity cost associated with every task that we do no matter what the time of day. These tasks will either cost you monetarily or in lost time with your family. Like Godin suggests, it is much better to quit the task you are not good at and concentrating on the ones that you can knock out of the park. What tasks do you quit? I think TV is the biggest waste of time. But like anything else, it is ok if you consume it in moderation. There are shows that you may enjoy watching that are purely for your entertainment. There is nothing wrong with entertaining yourself once in a while. Also, if you enjoy mowing the grass, fixing your car, or doing any task like that, why should you not do it? Nice and effective tips to save money and explained in a fun way. Transportation and car repair accounts for a big chunk of expenses, and fixing your own car along with learning to drive it in a fuel efficient manner would help you to save more.